In 1949, Hiroshima University was founded with our hope of reborn and peace after an atomic bomb which completely destoryed Hiroshima City. And now, we have a reputation as a leading university among education universities in Western Japan, as well as being prominent among all the universities of Japan for its large number of students. Hiroshima University consists of 12 schools and 11 graduate schools, and is performing the education and research activities corresponding to various demands in our society under globalizations, informatization, lifelong learning, and international cooperation. 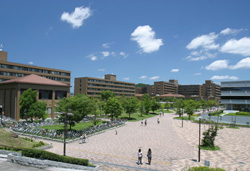 Aside from the undergraduate and graduate programs, Hiroshima University offers a variety of unique research centers including the Research Institute for Higher Education, the Center for Peace, the Morito Institute of Global Higher education, and the Research Institute for Radiation Biology and Medicine. Separated from the bustling city and surrounded by abundance of nature, the vas Higashi-Hiroshima Campus provides the perfect study environment. The School of Education and Graduate School of Education are prestigious institutes in the area of education in Japan. We have nurtured a great number of leading teachers for preschools, primary schools, junior and senior high schools, and special needs schools. The School of Edcuation and Graduate School of Education are active in international exchange program recently and regularly with over 200 international students on campus. We also have accepted a total number of 65 teacher training students from different countries since this program started. A six-month intensive Japanese language course at the elementary level is offered i the Morito Istitute of Global Higher Education (about 30 hours of instruction per week). As long as main supervisor accepts, they could be admitted directly into academic training (if necessary, with the intermediate or advanced Japanese Language/Japanese Affairs course) for one and a half year without the above-mentioned intensive language courses. We provide for individual academic tutoring by main supervisors and conduct in-depth research on respective training themes during one-year academic training. At the end of the course, teacher training students are required to submit their final report as a part of their course work. Participatory subjects on international exchange and etc. Special-curricular activities and cultural programs with Japanese students will be organized by university such as school visits, exchange programs, and tours to historical places in Hiroshima. Main supervisor will conduct follow-up activities for graduates rather than institutional activities. All the graduates are actively working in their own country as a leading teachers with high expertise. The increase in the number of international students at Hiroshima University might cause that it is not always possible to find any suibtable accommodation in one of the university’s dormitories. There are cases when some students have to rent a regular private apartment. In order to cover living expenses and set-up costs until the time of the first scholarsip pament, it is suggested that students bring a minimum of \100,000 with them to Japan. [International House]: Length of Stay 6 months; Room size 13㎡ , Rent Fee ￥5,900/month and Common House Expenses ￥2,500/month; Walking time to School of Education 20mins or Cycling time 10mins. [Ikenoue Dormitry]: Length of Stay 2 years; Room size 10-14㎡, Rent Fee \4,700-15,000 and Common House Expenses \2,500/month; Walking time to Graduate School of Education 15mins or Cycling time 7mins. [Leased Accommodation by University]: Legth of Stay 2 years; Room size 18-24㎡; Rent Fee(including common house expenses) \8,000-18,000; Cycling time to Graduate School of Education 10-30mins. [Sunsquare Higashi Hiroshima]: Length of Stay 1-4 years; Room size 17㎡ , Rent Fee ￥20,000 and Common expense charge \2,500/month; Furniture/Equipment Use Charge \1,000/month, Deposit ￥40,000; Traveling Time to Graduate School of Education: Bus 15mins or Bicycle 40mins.